Citation Information: J Clin Invest. 1999;103(6):833-841. https://doi.org/10.1172/JCI4320. Template-independent nucleotide additions (N regions) generated at sites of V(D)J recombination by terminal deoxynucleotidyl transferase (TdT) increase the diversity of antigen receptors. Two inborn errors of purine metabolism, deficiencies of adenosine deaminase (ADA) and purine nucleoside phosphorylase (PNP), result in defective lymphoid development and aberrant pools of 2′-deoxynucleotides that are substrates for TdT in lymphoid precursors. We have asked whether selective increases in dATP or dGTP pools result in altered N regions in an extrachromosomal substrate transfected into T-cell or pre–B-cell lines. Exposure of the transfected cells to 2′-deoxyadenosine and an ADA inhibitor increased the dATP pool and resulted in a marked increase in A–T insertions at recombination junctions, with an overall decreased frequency of V(D)J recombination. Sequence analysis of VH-DH-JH junctions from the IgM locus in B-cell lines from ADA-deficient patients demonstrated an increase in A–T insertions equivalent to that found in the transfected cells. In contrast, elevation of dGTP pools, as would occur in PNP deficiency, did not alter the already rich G–C content of N regions. We conclude that the frequency of V(D)J recombination and the composition of N-insertions are influenced by increases in dATP levels, potentially leading to alterations in antigen receptors and aberrant lymphoid development. Alterations in N-region insertions may contribute to the B-cell dysfunction associated with ADA deficiency. Analysis of TdT-mediated N-region insertions at signal and coding joints. (a) pSJ-F1 and pCJ-F1 plasmid substrate. (b) Fifteen illustrative N-region insertion sequences are shown for signal or coding junctions. Nucleotide insertions are shown between the adjacent sequences in the recombined joint. G + C = 75% and A + T = 25% for total number of N-region nucleotides analyzed at signal joints. 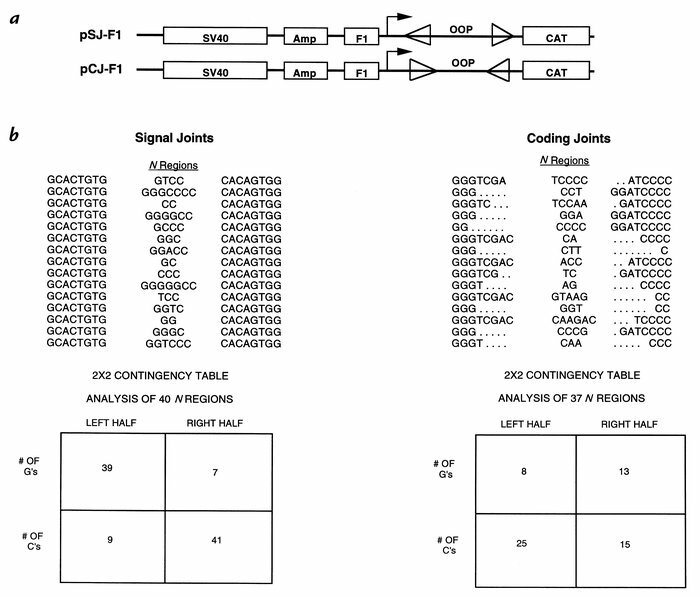 G + C = 67% and A + T = 33% for total number of N-region nucleotides analyzed at coding joints. A 2 × 2 contingency table analysis of G–C composition of 40 independent recombinants containing N-region insertions is shown. For the purposes of G–C analysis, the N region was divided into left and right halves, with the central nucleotide omitted for odd numbers of nucleotides. The P value determined for equivalent N-region addition to each strand versus no effect, according to the Fisher's exact test, was P < 0.0001 for signal joints and P = 0.105 for coding joints.